Rochester, NY/Alfred, NY - The New York State College of Ceramics (NYSCC), the statutory college at Alfred University, has formalized an agreement to extend its START-UP NY program coverage to a facility owned by AHEAD Energy Corporation, located at 285 Metro Park in Rochester, NY. This change supports New York State’s education and technology-led approach to economic development. The facility will serve as a unique location for cleantech product development, demonstration and commercialization. It will attract academic spinouts and local start-up companies as well as established businesses, and will serve as a magnet for US-based product development for cleantech companies from around the world. “Alfred is proud to help support the growth of New York State’s thriving alternative energy sector. Our vast expertise in the development of innovative technical ceramic materials will help to enable the development of a number of new clean energy technologies that will benefit from our partnership with AHEAD Energy,” said Alfred University President Mark Zupan. Development/NYSTAR, positioning Alfred to provide industry with access to the University’s technical infrastructure as well as with cost-share to companies housed at the AHEAD facility and across New York State. AHEAD Energy has indicated there is an opportunity for naming rights for this facility. Inquiries may be directed to Eleanor Rusling, executive director of AHEAD Energy at ExecDir@aheadenergy.org. partnerships enable companies to access faculty, industry experts, equipment and advanced research facilities associated with the schools; and create new opportunities for students to receive first-hand experience and internships with START-UP NY businesses. Dozens of colleges and universities across New York State are participating in START-UP NY, with more than 650 approved zones that represent over 7 million square-feet of eligible space for new or expanding businesses to operate on or near campuses. Each college and university’s approved START-UP NY plan is available at www.startup.ny.gov. ● David Gottfried, Alfred University, gottfried@alfred.edu 585-738-0908, cell. ● Ellie Rusling, Executive Director, AHEAD Energy Corporation, 501c3, ExecDir@aheadenergy.org 585-749-2716, cell. ● James Grieve, Chair, AHEAD Energy Corporation, 501c3, mjgrieve@aheadenergy.org 585-749-6132, cell. 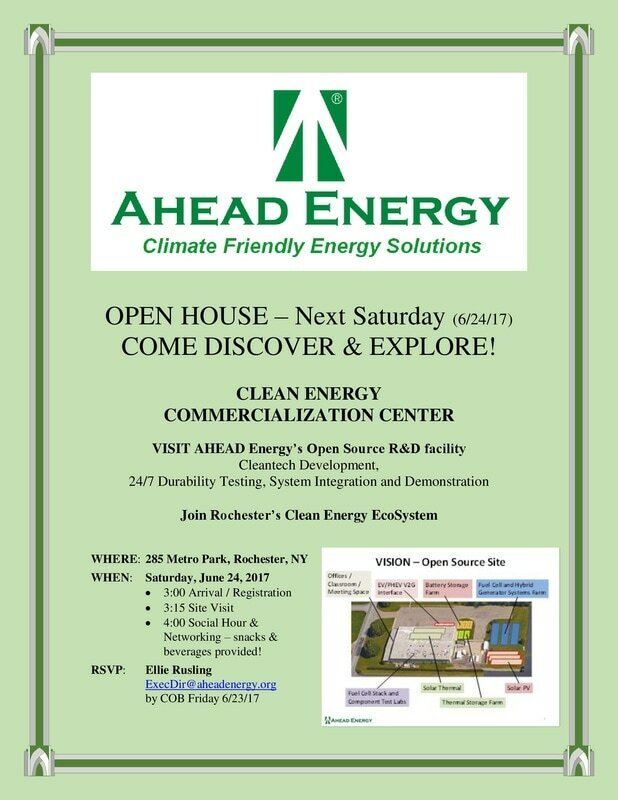 AHEAD Energy, 501(c)(3) invites you to meet with its Board of Directors to preview our re-vamped R&D facility! Our intent is to create an Open Source R&D / Commercialization Center for Fuel Cells and Clean Energy. This is a unique opportunity to provide input as to how this Center may be of service to you and your business. Please join this gathering of New York’s Clean Energy EcoSystem! "The ARPA-E Energy Innovation Summit is an annual conference and technology showcase that brings together experts from different technical disciplines and professional communities to think about America’s energy challenges in new and innovative ways. Now in its eighth year, the Summit offers a unique, three-day program aimed at moving transformational energy technologies out of the lab and into the market."